August 6, 2010 - by InterestingFacts.org - 10 Comments. A female eagle is ten to twenty percent larger than a male eagle. In Zoological terms, heaviest means largest, according to which, the Philippines Eagle would be the largest, but actually speaking, the Harpy Eagle scores better. If the longest wing span is considered, the longest span is of the Wedged tailed Australian eagle, with an estimated wing span of 230-250 centimeters. The largest ever is the Haast’s Eagle, also called Harpagornis Moorei. It is 4.5 feet long with 10 feet across the wings and weigh at least thirty three pounds. This species of eagles is now extinct. The Steller’s sea eagle is the heaviest living eagle weighing fifteen to twenty pounds. The Philippine eagle, also known as monkey- eating eagle has the largest physical dimensions with Harpy eagle being the bulkiest. lets Protect Harpy Eagle Keep save. 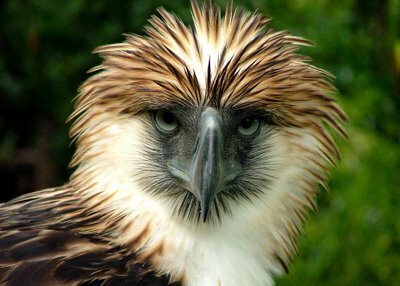 Why not clone the Philippine Eagle? harpy eagles r fantastic creatures. they have amazing WINGS!!!!! HARPY EAGALS ARE BEAUTIFUL BIRDS. THEY SHOULD NEVER BE KILLED INTENTIONALY. BEAUTIFUL BIRDS!!!!!! !